This week I was picking out small scraps of material and making a selection of centres to use in the hexies. I have quite a lot of small cream scraps and thought that using too many of them would look a bit bland. So I decided to do a floral embroidery on some of the centres. 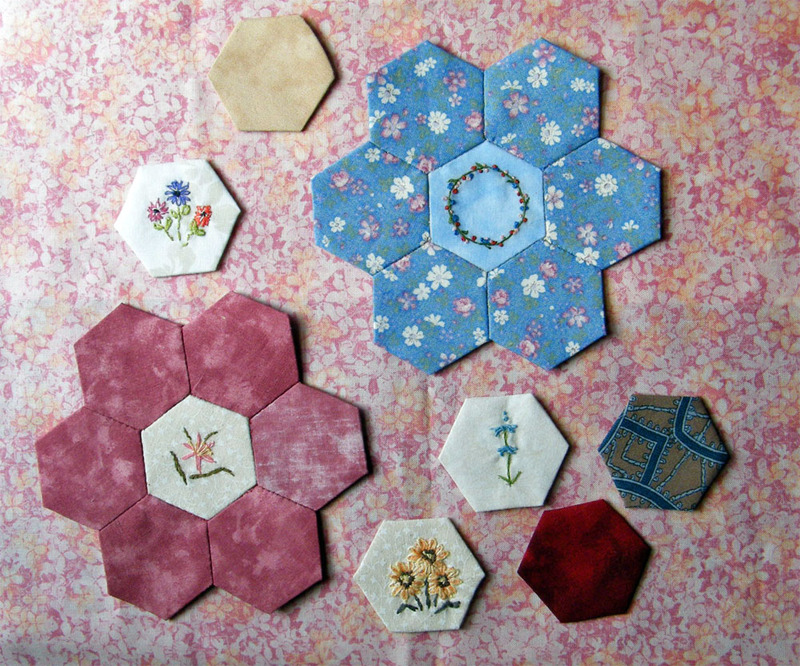 I'll just scatter these through the quilt among the hexies with plainer centres. I must do something different next week as I risk becoming obsessed by hexies to the exclusion of all else. And this week's reading. Not a new book but Barbara Kingsolver's first novel "The Bean Trees", from 1988. I've enjoyed most of her books. Also found a DVD of a 2010 movie which though terribly sad was well worth while. It was "Matching Jack". Just how does a family cope with finding out their child has leukaemia, I'll definitely watch this film again. Oh my goodness! Those are beautiful! What a great idea. How I want to do more hexies, who cares about triangles!